I have never liked the plastic feel of the XP1K steering wheel or how it did not make my grip any better with gloves on. Considered a new wheel every season...the $$$ and needing to get a special tool to remove the stock wheel just did not seem worth the effort. 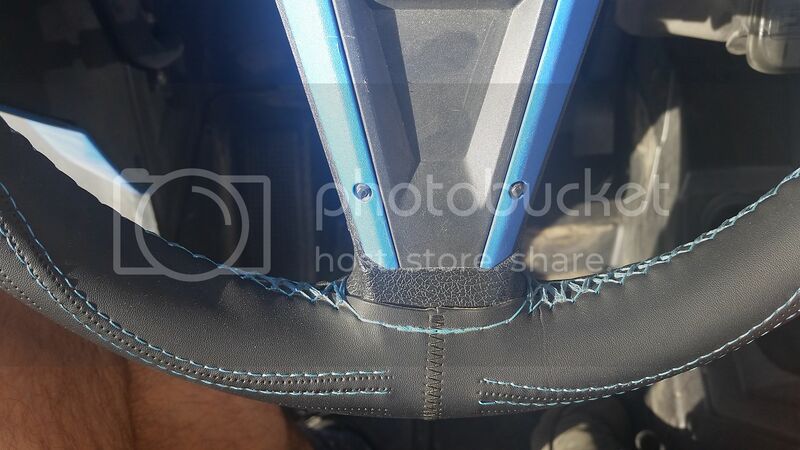 On a whim, I started searching for steering wheel covers that are stitched on, as I have used these with great satisfaction on my vehicles. Have now used it on two Glamis trips with about 8 days of riding...and it not only feels good...looks good...it works excellent. Much better feel and grip. For $9 and 45 minutes of my garage/music/beer time....a no brainier. Size small 14.1 in blue. If you want a perfectly tight fit, add one layer of grip tape or similar on wheel first, otherwise, just pull the needle good and tight and it is pretty darn good. dartersracing, Gregg628, Dunepilot and 11 others like this. I like this... but worry about mud, dust, water and sweat intrusion getting between the wheel and cover. Then potential of mold or yucky smells? I'm in the desert but still see water being a problem and not drying out completely or in a timely manner. Any comment on this? ETA: These things weren't intended to be used on vehicles open to the elements, I don't believe. I could be wrong? You make so good points that I did not even consider, likely as I only ride dunes and never when it is raining, rather just chill in the trailer. I guess it could get wet while sitting outside while I wait for weather to pass, but not much different than my seats getting wet. I just towel them off and I'm good to go. I have obviously never experienced mold issues out here in very dry southern CA. I ordered this one just because it comes with a matching shifter cover. Macs Dad, Gregg628, 185EZ and 1 others like this. I ordered one up for testing in the humid and wet Midwest. I avoid mud but it will get wet with rain and washing. I imagine it will dry out fine. For $9 you can't go wrong. Just wondering if a leather waterproofing or seam sealer would help in protecting from the elements. Did you have a women sew the cover on? I love the Engrish descriptions. Looks really nice. How hard is to take off and put on to clean in out ? Never mind. Just looked at the rest of the pictures and you have sew it on. Looks pretty tight though. Still looks really cool. Last edited by Macs Dad; April 9th, 2019 at 02:07 PM. That one is great! Definitely not recommended for those who play in the mud. Thanks for the link Sloberdog. 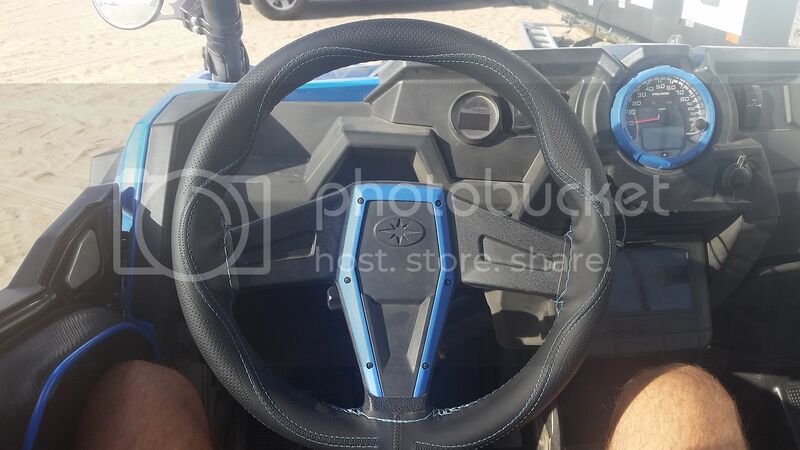 I have a leather wheel in my RZR, but ordered one for my Jeep! Nice job, but no special puller needed. I got my factory wheel off with a makeshift puller fabbed by drilling 3 holes in a piece of angle iron, 2 - M6 screws, and an old bolt & nut I had laying around.... including the fab work, it took about 15 minutes total. I can’t beat $9 for the replacement, but I went with a alcantera/micro-suede wheel, and couldn’t be happier. Life is short, drive fast! Anyone going this route be sure to draw the strings very taught because I got 3 inches from being done and ran out of thread. I unthreaded it and could have gotten it done but found I liked the bare steering wheel better anyway and decided not to use the cover. Did you thread continuous all the way around or stop and restart between each spoke?